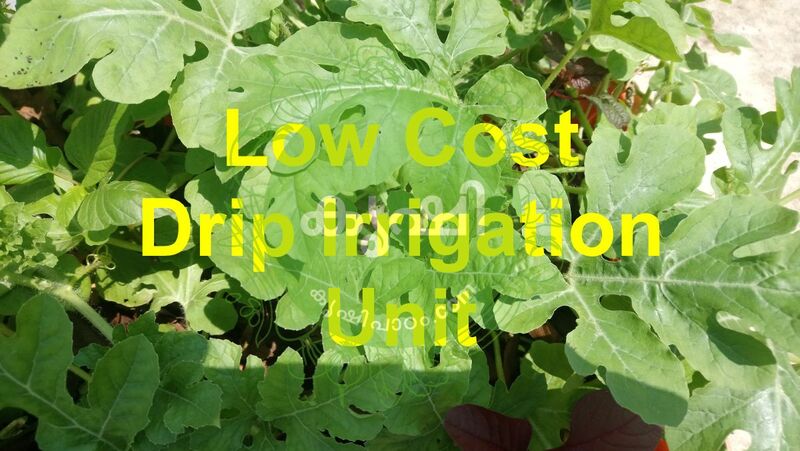 Today we are discussing about making an effective low cost watering unit for home terrace garden. This summer season we can care our vegetable plants by spending less than 10 R.S. This is just an idea, you can modify the same for better results. It’s the miniature of Drip Irrigation system at garden. We need the following parts for making this low cost watering system. we have already uploaded some similar videos here like wick irrigation. empty cola bottles need for making Low cost drip irrigation unit, 1 liter or 2 liter is preferable. next is 4mm feeding cable, you can purchase it from local shops or from online. emitter is another part using, it should be connectable to 4mm feeder cable. adhesive , use fevi bond or fevi kwik to prevent leakage. make a small hole at bottom side of the bottle, 3mm dia will give better results. now attach 4mm drip irrigation feeder cable and apply adhesive to prevent water leakage. wait for 3-4 hours, cut the top portion of the bottle, add water (you can add any type of liquid fertilizers also). adjust the force of water by rotating the knob of emitter. place it in grow bags or containers, this will help us to save water and proper watering to our vegetable plants. if you like the video please like and subscribe, drop your comments.